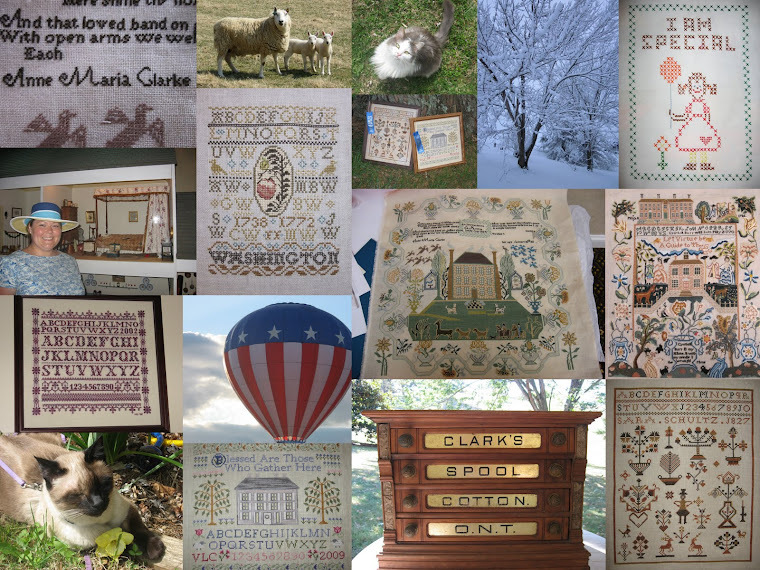 A Shenandoah Sampler: Welcome to Sharlotte, Tracey and Ranae! I was thrilled that you came by to visit! Thank you for the wonderful comments! Yes, I am a lucky girl and all those wonderful charts will certainly keep me busy! Sharlotte - about the quilt...I wish I could say that I made it but alas I must give credit to LL Bean. I found it in a LL Bean outlet this summer. I loved the colors and I put it on the daybed that I have in the computer room. I just makes everything so much brighter! Thank you for the compliment! Tracey - I know that you must LOVE your Ott-Lite! I bought mine at Michael's this summer with a 50% off coupon + 15% more off! I hit the jackpot on that one! However, I would pay full price if something happens to the one that I have. It is indispensible! Enjoy your stitching! Again ladies, thank you for coming by. I look forward to keeping up with your blogs! Happy Stitching! Thank YOU for visiting my blog that led me to yours Valerie! I look forward to getting to know each other!